“Fight Aging with Food” Presentation: Learn about eating strategies that slow down the aging process, lower inflammation, improve digestion and increase energy. Healthy Lunch: A full sandwich bar with sides, drinks and dessert. Food allergies or special diet? We’ve got you covered! Journaling Session: Tap into your inner voice and cultivate authentic self-expression through the art of writing. Personal Style Visioning Exercise: Craft your own vision board that represents your true style. Attendees are welcome to come make-up free, and to dress in comfortable clothing suitable for a yoga session and a productive day. The aim is to have fun, learn about yourself, see old friends and new, and come away with a refreshed perspective and a revived spirit! Carrie McConkey owns Carrie M. Fashion Consulting. She loves helping individuals discover their signature style through one-on-one consultations, providing assistance with image, wardrobe, and color analysis, all with a caring, warm, and personal touch. Learn more about Carrie here. Nicole Fey is a healthy eating specialist and health coach. She is also a certified Personal trainer, Yoga Instructor, Feng Shui consultant and Reiki Master. Nicole counsels individuals and groups using her unique combination of healthy mind, body and spiritual areas of expertise. Learn more about Nicole here. Lighthouse Knoxville Event Center is conveniently located off Baum Drive in the Bearden area of West Knoxville, but feels like a private retreat. A wonderful view, easy parking and the 8-acre campus make Lighthouse Knoxville a gem. Learn more about Lighthouse Knoxville Event Center here. THE POST-HOLIDAY DETOX: Cleanse In The New Year! If you overindulge during the holidays, detoxifying the body can get you back on track! 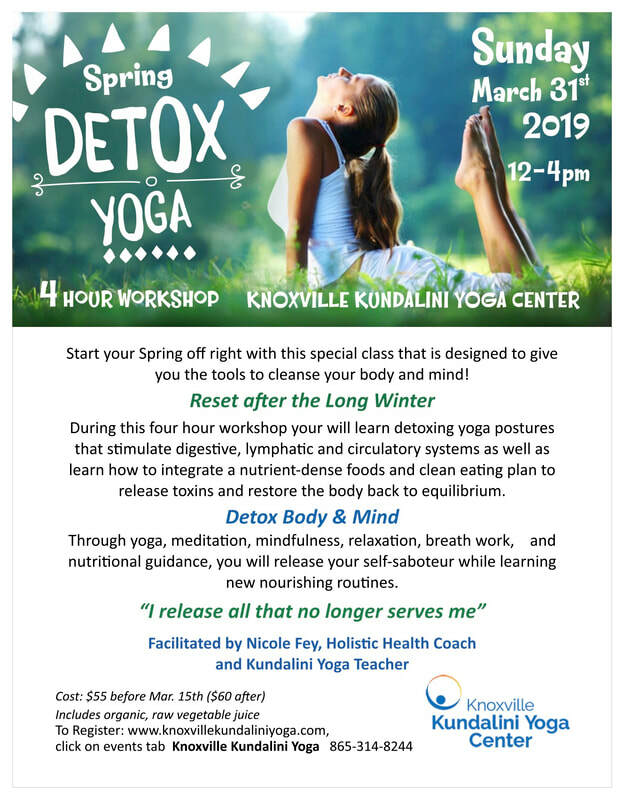 Join Nicole Fey for this informative workshop and learn how to use Simple Detox Methods including Juice Therapy to rejuvenate and revitalize your health. Workshop includes a live demonstration and a tasty, organic vegetable juice. Are you ready to clear out the toxins that are weighing you down? Do you want to start and end each day feeling energized? Do you want a health routine that’s easy, fun and do-able? Then you’re ready to cleanse and detoxify your body! After many years of eating and living, the colon becomes toxic from pesticides, herbicides, air pollution, household chemicals, food additives, undigested food, and over-processed foods. This causes a systematic weight gain over the years usually concentrated in the midsection and/or cellulite. Nicole Fey is an author and certified Holistic Health Coach, She graduated from The Institute for Integrative Nutrition in New York City and is a member of The American Association of Drugless Practitioners. Growing up as a slckly kid and sugar addict, Nicole credits her poor eating habits and myriad health problems as the catalyst into an intense journey of self-healing and self-care through juicing, whole foods and a holistic lifestyle. Nicole works with private and corporate clients and elementary schools sharing her expertise and enthusiasm for juicing, whole nourishment and radical self-care for real life health transformations. Hey Nicole! I've been on the road like crazy the past few months and have been rather overwhelmed with work. However, I have not wavered from my newfound life-changing eating and juicing habits. I continue to have my vegetable juice every morning and lost another 5-7 pounds! I feel so much better than I did last August, which is when I started my juicing regimen. Wish I had done this 10 years ago! Nicole will be selling & signing copies of her new book, The Ultimate Juicing & Holistic Health Program, before and after the workshop. Kundalini Yoga is yoga for these times. Decades ago, Yogi Bhajan predicted that life would become more and more stressful and chaotic, creating stress-related physical, mental and spiritual imbalance in people. Powerful Kundalini mantras, postures and kriyas passed down through the ages have left us with the tools to take ourselves out of distress and cultivate a peaceful mind. Nicole Fey presents Kundalini Yoga and Meditation. Called "the yoga of awareness," kundalini yoga combines yoga poses, breathwork, mantra and meditation to provide a complete physical, mental and spiritual experience. Slow down the aging process through the practice of Kundalini yoga! Join Nicole Fey, HHC, E-RYT-200, YACEP, for a weekend immersion into the practice of Kundalini Yoga. From yogic principles to methodology to experiential learning, this weekend will awaken your soul and give you practical tools to create your yoga practice or deepen your existing one. The ability to cultivate a peaceful state during stressful or chaotic times. Laith Keilany has been a talented presence in the Knoxville music scene for over a decade. He has performed with many Knoxville musicians, such as Jodie Manross, Greg Horne and Casey Jones as well as dance companies such as Momentum and Circle Modern Dance. With Jodie Manross, Laith Keilany has opened for diverse artists such as BB King, John Mayer, Keb Mo, Sugarland, Dar Williams, Norman Blake and Leon Russell, released four albums and has had original music featured on television shows such as So You Think You Can Dance. On occasion when he performs solo, he provides instrumentals featuring the guitar, the oud and cumbus. When he is not on stage, he teaches guitar and ukelele at Pick n Grin in Bearden. ​Michael Lott is a transformational and healing catalyst who helps people tap into their inner light through his offerings as a Kundalini yoga teacher, a sound healing enthusiast, and as a seasoned intuitive counselor & spiritual teacher. Kundalini yoga has been a large part of Michaels personal transformational toolset for many years and more recently he began teaching ongoing classes to share this powerful yogic technology. Since completing the KRI 200hr Kundalini yoga teacher training program, he has also found a passion for playing and experimenting with the gong as a sound healing tool in his ongoing Kundalini Yoga classes and private sessions. Yogi Bhajan brought Kundalini Yoga to the West in 1968. He taught over 8,000 classes and inspired thousands of people to keep up and live in their excellence. Arriving first in California, Yogi Bhajan understood that the youth were seeking connection to higher consciousness but were going about it the wrong way – through drugs and “half-baked mysticism.” He taught his students tirelessly, created Yoga Teacher Training, Women’s Camp, Summer and Winter Solstice, established the first interfaith International Peace Prayer Day in 1985, and has authored over 30 books on his teachings. Nicole discovered the healing power of yoga at 37 years old after experiencing a lifetime of anxiety and back pain. Completely transformed by the effects of Kundalini Yoga after taking classes in Maui, Hawaii, Nicole earned her 200-hr certification through the Kundalini Research Institute and went on to teach classes to students desiring a yoga that calms the mind and brings emotional balance and resilience to body, mind and spirit. Nicole teachers the purest form of Kundalini Yoga, as taught by her teacher, Yogi Bhajan. With a reputation as a “spiritual” yoga practice, Nicole strives to teach this yoga in a practical, grounded way to make it accessible to beginners as well as challenging for even the most adept yogi. Please bring your lunch and any snacks you will need. Yogi Tea will be provided. Kundalini Yoga is a spiritual practice, appropriate for all religions and lifestyles. It is a system to tune-up and bring balance to the body, while uplifting your mood, relieving stress and calming the mind. A joyful holistic yoga immersion course for women seeking self-expression and support for creating positive change in the world. Friday 1pm through Sunday 5 pm. communing in nature, cleansing, vistas, healing and deep meditation. The world is changing rapidly. And you must focus and refresh yourself on a daily basis. You need to have a strong body, a clear mind and fresh and relaxed perspective in order to function at your highest capacity You’ve made the decision to be a leader and changemaker and yet, you need support to see yourself through this part of your journey. You are a whole being, all parts cherished, nourished and cared for. Your spirit needs to stretch and grow, your mental consciousness needs to be sharp and intuitive and your body yearns to be healthy and balanced. And at the same time, you must relax and retreat in order to regenerate your energy, your ideas, your life force and your feminine power. Yogis, seers and sages forsaw these times coming. They predicted a shift in consciousness that will influence the way we live, the way we create livelihood, the way we relate to one another. Individually and as a humanity, we are being challenged in everything from how to survive, how to provide for our loved ones, how to help ourselves and how to help others. You don't have to do this alone. There is support and power in yoga, self-care and in coming together. As we get a sense of how to heal the self, the ideas and inspiration flows, a deeping of self-awarenss and what you capable of. The time is now for us as aware and conscious women to open up to our full potential, to tap into our wisdom and intuition and to embrace our roles as Changemakers. It is time to understand our full capacity as women, as humans and as agents of change for a better world. WHAT WILL THIS WEEKEND GIVE YOU? Motivation, self-confidence, organization, a sense of the self as a whole being, deep peace, abiding calm and a waking up of your own heartstrings. Retreat Facilitators: Nicole Fey and Ajeet KhalsaWe are both reaching into the true spirit of our life mission by offering women sacred time away to cleanse, detoxify, lay on the earth and heal, talk together and go deep with each other, taking time to journey, connect with nature, journal insights and inner awakenings, do scrumptious yoga, meditate and create a harmonious time with other women filled with grace so that we may truly live the change that we are being called to do, with dignity, caliber. 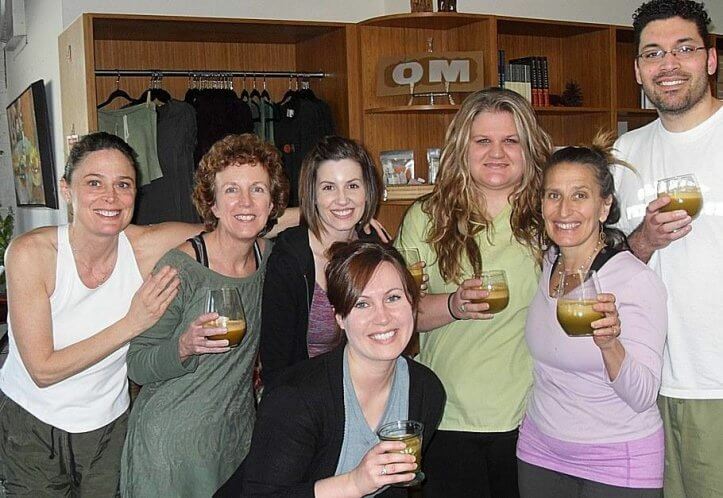 Nicole Fey, Yoga Teacher, Health Coach and Detox Specialist coaches clients in radical self-care. An authority on creating new pathways in life, Nicole meets you at the crucial crossroad in your life, the point where you realize that the lifestyle and eating habits you had earlier in your life, are no longer sustaining or serving you. Nicole simplifies and demystifies how to embrace radical self-care and overthrow the self-sabatour. Among her tools in her tool kit, are certifications in Nutrition, Personal Training, Reiki, Feng Shui and Bau-Biologie. Author of The Ultimate Juicing & Holistic Health Program and founder of the True Nourishment Programs & Master Your Midlife Programs, Nicole and has been working with clients since 1999 that want to push the restart button on their health, cultivate their own personal healthy lifestyle routines, and joyfully sustain true work/life balance. Ajeet Khalsa,E-RYT and RCYT, is a performing artist and has shared Kundalini yoga as a teacher since 1996. She has recently become certified as a Magic 4 Svaroopa© yoga teacher, offering women a reliable release of spinal tension and a deeper experience of comfort in their bodies. Her popular children’s yoga training Dancing Spider Yoga and Parenting with Radiance programs and weekend trainings help parents and educators to discover deeper connection & peace with their children. Ajeet has spent decades as a social artist and activist working with community organizations in the Southeast to create viable and vital change. ​Her one woman performance art piece, Aprons, was chosen as a National Performance Network local artist pic. Lately, she works as an independent artist and educator, spending time focused on deepening her relationship with the divine and creating useful children's theatre arts and kids yoga programing for schools, community centers, and museums around the the US and Europe. A world citizen, in the coming years, Ajeet's creative dream is bringing artistic, culture awareness through peaceful yoga programming to strengthen bonds so families and communities have tools to live in harmony and peace. Margo Miller is the executive director of the Appalachian Community Fund, a publicly supported, non-profit grantmaking organization that provides resources and support to grassroots organizations working to overcome the underlying causes of poverty and injustice in Central Appalachia. She has helped leverage over a million dollars to support social justice work in Central Appalachia. Through her work with various networks, like Alternate ROOTS and the National Performance Network, she has had the opportunity to work and collaborate with artists, arts organizations, and organizers all over the United States. All of this work has helped her form a strong affinity for art and culture and social justice. She currently serves on the leadership team of the Art Culture Social Justice Network (ACSJN). She is committed to making a difference in her community by finding ways of building sustainable and resource generating partnerships that benefit and celebrate our diverse and rich culture. In this series, you will learn the foundation of Kundalini yoga, experience the myriad benefits to body, mind and spirit, and develop the skills for a home practice. Kundalini Yoga is for you if you want to lower your stress-levels, balance your mind and emotions, deepen your inner awareness and uplift your spirit. Kundalini Yoga is truly a mind, body, spirit discipline. It is a dynamic blend of postures, breathing, movement, stretching, meditation, mantra and relaxation, that builds endurance and resilience, strengthens the nervous system, expands the lung capacity, purifies the bloodstream, calms the mind, and expands your consciousness. Nicole Fey is a K.R.I Certified Kundalini Yoga and experienced registered (ERYT) instructor who completed her 200-hour training in New York City in 2007. Since healing her own chronic back pain and anxiety through Kundalini yoga, she is passionate about sharing this powerfully transformative practice with everyone! Nicole teaches private, group and corporate clients and has worked with Rubbermaid, Caris Health, Rabobank and John Wiley & Sons. Nicole is the co-creator and organizer of the first ever Yoga Festival in Tennessee, The Kundalini Rising Yoga Fest. Utilizing the therapeutic effects of Kundalini yoga combined with nutritional coaching, Nicole has created the Master Your Midlife programs and works with clients that want to push the restart button on their health, lose the midlife bulge and feel as good as they did 20 years ago. Visit her website. Healthy Snacks will be served!! Come for a day of nurturing self-care and community! Having been blessed with her own beautiful belly for the first time at age 41, Nicole Fey knew the benefit of cultivating and sustaining a healthy diet for self and baby-to-be. Certified as a Holistic Health Coach and Nutrition Counselor by The Institute for Integrative Nutrition, Nicole has created a simple, yet flexible system for sticking to a nourishing, immune-boosting, microbiome supporting eating plan that will make a difference in your pregnancy, birthing, newborn's health and post-pregnancy body. Gina has worked with pregnant women and their families since 1999. She is a certified prenatal yoga teacher. She weaves her experience as a licensed massage therapist, craniosacral therapist, child birth educator, spiritual counseling, and mother into her work. She currently teaches yoga on Saturdays at Glowing Body, and her joy for teaching is to offer women a supportive, nurturing, and mindful environment to empower them to find their strength and beautiful connection with their babies.